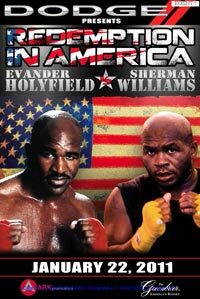 Streaming service Justin.tv and video-sharing site YouTube were sued this week by Ark Promotions for allegedly displaying a pay-per-view boxing match between Evander Holyfield and Sherman Williams. In a complaint filed in federal district court in Charlotte, N.C., Ark alleges that Web users uploaded streams of the $29.99-per-view fight on Justin.tv contemporaneously with the Jan. 22, 2011 broadcast. Ark asserts in the complaint that it unsuccessfully demanded that Justin.tv stop the real-time streams. "As a result of defendant Justin.tv’s failure and refusal to stop the unauthorized reception and transmission of the Live Broadcast over the www.justin.tv Web site, at least thousands of people viewed the Live Broadcast without having to pay for it via the pay-per-view package," Ark alleges in its complaint, filed on Monday. Ark also alleges that pirated clips of the fight were available on YouTube on Jan. 22 and 23. "YouTube was aware that its Web site had repeatedly been used to illegally broadcast copyrighted works without authorization of the copyright owner," Ark alleges. The promotional company asserts in its court papers that it heavily touted the fight by purchasing ads on TV and online and via posters, one of which it submitted along with its complaint. The company says it "reasonably anticipated that it would recoup its investment in the live broadcast through its pay-per-view sales." Ark argues that YouTube and Justin.tv infringed copyright and also violated laws regarding the unauthorized reception of cable service and a privacy law governing unauthorized publication of cable communications. But Ark likely will face an uphill battle, says New York Law School professor James Grimmelmann. "The complaint seems weak," he says, adding that the Digital Millennium Copyright Act's safe harbor provisions appear to give YouTube and Justin.tv a defense to the copyright infringement allegations. Those safe harbors generally provide that Web companies are immune from liability for piracy, as long as they take down with infringing material upon request. In YouTube and Universal's losing lawsuit against Veoh, judges have said that Web sites are protected as long as they remove specific URLs flagged as infringing by content owners. Judges in those lawsuits rejected arguments by content owners that Web sites must proactively seek out and remove material based on its general description or title -- such as all clips of a particular movie, TV show or event. Grimmelmann also says that Ark likely can't prevail on the theory that Justin.tv or YouTube violated laws that make it illegal to intercept or publicize cable transmissions. Under Ark's theory, individual Web users have intercepted transmissions and then uploaded them. "Justin.tv and Google have done none of those things," Grimmelmann says.